ZOLL Medical Corporation (Nasdaq GS: ZOLL), a manufacturer of resuscitation devices and related software solutions, has received 510(k) clearance from the U.S. Food and Drug Administration (FDA) to market and sell the ZOLL R Series® Code-Ready® clinical defibrillator with a WiFi option that allows wireless communication between the defibrillator and standard hospital networks to help ensure code-readiness and download patient data. "Since defibrillators are widely distributed throughout hospitals, and their use is both infrequent and extremely critical, ZOLL's technology helps ensure code readiness when they are needed for a code," said Richard A. Packer, Chairman and Chief Executive Officer of ZOLL. "Introducing technology that helps clinicians save more lives is what ZOLL is about." With a simple click of a mouse, CodeNet system users can submit records to the American Heart Association's NRCPR (National Registry of Cardiopulmonary Resuscitation). ZOLL Medical Corporation is committed to developing technologies that help advance the practice of resuscitation. With products for pacing, defibrillation, circulation, ventilation, and fluid resuscitation, ZOLL provides a comprehensive set of technologies, including Real CPR Help® and See-Thru CPR®, that help clinicians, EMS professionals, and lay rescuers resuscitate sudden cardiac arrest or trauma victims. ZOLL also designs and markets software that automates the documentation and management of both clinical and non-clinical information. ZOLL markets and sells its products in more than 140 countries. The Company has direct operations, distributor networks, and business partners throughout the U.S., Canada, Latin America, Europe, the Middle East and Africa, Asia, and Australia. 2008 marks the 25th anniversary of ZOLL's resuscitation product development. For more information, visit http://www.blogger.com/. Certain statements contained in this press release, including statements regarding the future business of the Company, and other statements contained herein regarding matters that are not historical facts, are "forward-looking" statements (as defined in the Private Securities Litigation Reform Act of 1995). Because such statements are subject to risks and uncertainties, actual results may differ materially from those expressed or implied by such forward-looking statements. Factors that could cause actual results to differ materially from those expressed or implied by such forward-looking statements include, but are not limited to, those factors discussed in the section entitled "Risk Factors" in the Company's Annual Report on Form 10-K filed with the SEC on December 8, 2008. You should not place undue reliance on the forward-looking statements in this press release, and the Company disavows any obligation to update or supplement those statements in the event of any changes in the facts, circumstances, or expectations that underlie those statements. Copyright © 2008 ZOLL Medical Corporation. All rights reserved. 269 Mill Road, Chelmsford, MA 01824-4105. ZOLL, CodeNet, Code-Ready, R Series, Real CPR Help, and See-Thru CPR are registered trademarks of ZOLL Medical Corporation. One-Step is a trademark of ZOLL Medical Corporation. All product names are the property of their respective owners. Avoiding stress, arthritis and even cancer can be as easy as hanging up cellphones and tossing out microwaves, says an expert on electromagnetic radiation and local doctor. Speaking at a seminar at the University of Calgary yesterday, Dr. Robert Steller, a certified environmental consultant and inspector from Ontario, said international and domestic research shows prolonged exposure to electromagnetic radiation in the home, such as through wireless Internet technology, cellular and cordless phones, microwaves, computers and televisions, can produce harmful effects on the body. "A two-minute (cell)phone call is 20-million times higher exposure than healthy exposure would be," he said. "It's a good idea to avoid things like unplugging unnecessary cords in bedrooms, cutting down the use of cellphones, and don't buy a house near power lines." He also suggested changing shopping habits, such as buying low-emission computers and televisions. Man-made electromagnetic radiation is harmful to the body, especially children and the elderly, because they disrupt its natural molecular harmony leading to stress, said Bruce Hoffmann, director of the Hoffman Centre for Integrative Medicine in Calgary. High exposures can also lead to arthritis and can shrink DNA, ultimately leading to cancer, Hoffmann said. "There is an effect on health that needs to be taken seriously as to why someone's not feeling well," he said. Minimizing the use of electromagnetic appliances especially while sleeping, which is when the body detoxifies, standing at least three metres away from microwaves and about a metre from TVs and using 900 MHz cordless phones rather than 2.4 GHz ones will help make homes clean of harmful radiation, Hoffman said. Residents in Bushey have criticised a mobile telephone network for "sneaking through" a mast application before Christmas. A public consultation regarding O2's application for a communications mast in green belt land by Elstree Road started at the end of November and ended on Boxing Day. Residents concerned about the impact the mast will have on their lives suggested the consultation was intentionally run during a time when many people were on holiday. O2 communications manager Jim Stevenson strongly denied this saying the application had been ongoing since the start of the year and that the date of the consultation was unintentional. Almost 50 people have signed a petition against the application, a previous version of which was refused by Hertsmere Borough Council in August. Melanie Keaney, of Elstree Road, who spearheaded the campaign against the network, said the mast would be an "eyesore" similar to another mast in the nearby Spire Bushey Hospital, and a potential health hazard for residents. The 38-year-old said: "We used to think lead was safe and smoking was something it was ok to do. Masts haven't been around long enough for us to know what they do. She added: "There is certainly the feeling that they did try to sneak it through during the holiday period." Regarding the health risk, Mr Stevenson said: "Nothing has come out of any theory that says it will cause harm to anyone. There is no scientific evidence at all to support the claims and all of them have been very strongly researched and tested." After reading these comments, Henrik Eiriksson of www.mast-victims.org an "international community of people suffering adverse health effects from masts and antennas in the vicinity of their homes", dismissed them as "completely untrue". He said: "If you examine the World Health Organisations research database you will find that 80 per cent of studies on people living near mobile-phone masts show harm to health and quality of life of." These alleged effects include "horrifying" reports of brain cancer, headaches and ear-ringing. Regarding the damage to the green belt Mr Stevenson said the new design of the mast was thinner than the previous design in order to minimise its impact on the environment. He added that the mast was necessary because of new housing developments in the area and would improve many residents' mobile phone reception. He invited anyone with any concerns or comments to get in touch with O2. I have just read your story about the proposed O2 phone mast in Bushey and have written to support the information provided by Henrik Eiriksson. I am a former photographer with the Watford Observer, having worked there during 1974 and 1975, prior to emigrating to Canada and joining the Toronto Police Service. My time at the newspaper was very enjoyable and I often wonder about the friends I met and worked with. After retiring form the Toronto Police I became ill from exposure to electro magnetic pollution and developed a condition known as electro hyper-sensitivity. This means that I become ill if I am exposed to electro magnetic radiation from devices including cell phones, cell phone antennas, WiFi etc. I am a founding Director of WEEP - (The Canadian initiative against) Wireless Electrical and Electromagnetic Pollution. Our organization raises awareness of electrical pollution issues, suggests safety measures and helps many persons who have been harmed by electro magnetic radiation. The statement in your story about health risk, made by O2 communications manager Jim Stevenson is most disturbing, he is quoted as saying - "Nothing has come out of any theory that says it will cause harm to anyone. There is no scientific evidence at all to support the claims and all of them have been very strongly researched and tested." . His statement appears to be a lie, which needs to be exposed to your readership. It is very easy to determine that his information is false, by going to the Bio Initiative Report at http://www.bioinitiative.org/ and viewing the vast amount of scientific research which show serious harm to health caused by electro magnetic radiation. At the end of this message I have attached scientific information from the late Dr. Neil Cherry. This will give you a good understanding about the real dangers of microwave radiation which is used by cell phones and cell phone antenna masts. I hope that you are able to share this with Watford Observer readers. Please give my best wishes to anyone who who may remember me, from working at the Observer. Increase the incidence of many types of cancer, including leukaemia, brain tumor, testicular cancer, genitourinary and breast cancer, Robinette et al. (1980), Milham (1985, 1988), Szmigielski (1996), Hocking et al. (1996), Dolk et al. (1997 a, b), Beall et al. (1996), Grayson (1996), Thomas et al. (1987), Lilienfeld et al. (1978), Zaret (1989), Davis and Mostofl (1993), Hayes et al. (1990), Tynes et al. (1996), Cantor et al. (1995), and many others. · Alters brain activity including EEG, Von Klitzing (1995), Mann and Roschkle (1996), Krause et al. (2000). · Disturbs sleep, Mann and Roschkle (1996), Bordely et al. (1999). · Alters sleep EEG after awake exposure, Huber et al. (2000). · Brain cortex interaction as shown by significantly altered human EEG by cellphone radiation, during a 15 minute exposure, Lebedeva et al. (2000). · Weakens the blood brain barrier (p<0.0001): Persson, B.R.R., Salford, L.G. and Brun, A., 1997. · A Fifteen minute exposure, increased auditory brainstem response and hearing deficiency in 2 kHz to 10 kHz range, Kellenyi et al. (1999). · While driving, with 50 minutes per month with a cell phone, a highly significant 5.6-fold increase in accident risk, Violanti et al. (1996); a 2-fold increase in fatal accidents with cell phone in car, Violanti et al. (1998); impairs cognitive load and detection thresholds, Lamble et al. (1999). In a large Canadian study Redelmeier and Tibshirani (1997) the risk of collision when using a cellphone was 4 time higher, RR = 4.3, 95%CI 3.0-6.5. Calls close to the time of collision has RR =4.8 for 5 minutes and RR = 5.9, p<0.001, for 15 minutes. · Significant changes in local temperature, and in physiologic parameters of the CNS and cardiovascular system, Khdnisskii, Moshkarev and Fomenko (1999). · Causes memory loss, concentration difficulties, fatigue, and headache, in a dose response manner, (Mild et al. (1998)). Headache, discomfort, nausea, Hocking (1998). · Significantly increases blood pressure, Braune et al. (1998). · Reduces melatonin significantly, Burch et al. (1997, 1998). A GSM cellphone reduces melatonin, but not significantly in a very small sample (N=18) of subjects, de Seze et al. (1999). · A reported but yet to be published Australian Study, EMRAA News, June 2000, used a Clot Retention Test on blood samples to detect hormonal changes. A group of 30 volunteers used a Nokia 6150 cellphone for 10 minutes on each of two consecutive days. The CRT test showed significant changes in the thyroid, pancreas, ovaries, testes and hormonal balance. · Decreases in sperm counts and smaller tube development in rat testes, Dasdag et al. (1999). · Increases embryonic mortality of chickens, Youbicier-Simo, Lebecq and Bastide (1998). · Produces an up to three-fold increase in chromosome aberrations in a dose response manner from all cell phones tested, Tice, Hook and McRee, reported in Microwave News, March/April 1999. The findings were the same when the experiment was repeated and Dr Tice is quoted as stating: "There's no way you're going to get positive results twice over four different technologies as a chance result." · Doubles c-fos gene activity (a proto oncogene) for analogue phones and increases it by 41 % for digital phones, Goswami et al. (1999), altered c-jun gene, Ivaschuk et al. (1997), Increased hsp70 messenger RNA, Fritz et al. (1997). · Increases Tumour Necrosis Factor (TNK), Fesenko et al. (1999). · Increases ODC activity, Penafiel et al. (1997). · Doubles the cancer in mice, Repacholi et al. (1997). · Increases the mortality of mobile phone users compared with portable phone users, RR = 1.38, 95%CI: 1.07-1.79, p=0.013, Rothman et al. (1996). · Significantly increases the incidence of eye cancer (Uveal Melanoma), by between OR = 4.2, 95%CI: 1.2-14.5, and OR = 10.1, 95%CI: 1.1-484.4, Stang et al. (2001). · Carlo and Schram (2001) report that in the industry funded WTR (Wireless Technology Research) programme Dr Joseph Roti Roti confirmed the Tice, Hook and McRee research showing that cellphone radiation significantly damaged DNA through observed micronuclei formation. · Muscat et al. (2000) report elevated brain cancer in cellphone users in the United States, with cerebral tumors occurring more frequently on the side of the head where the mobile phone had been used, (26 vs 15 cases, p=0.06) and for a rare brain cancer, neuroepitheliomatous, OR = 2.1, 95%CI: 0.9-4.7. Mean use of cell phones was 2.5 years for cases and 2.2 years for controls, showing that a small increase in cellphone use (0.3 years) produces a large increase in brain cancer risk. Table two shows that even with little cellphone use, and even with the use of a high cancer reference group, there areseveral elevated cancers approaching significance: Testicular cancer SIR = 1.12, 95%CI: 0.97-1.30, Cervical cancer, SIR = 1.34, 95%CI: 0.95-1.85, Female Pharynx cancer, SIR 2.43, 95%CI: 0.65-6.22, Esophagus cancer, SIR = 1.53, 95%CI: 0.31-4.46 and female breast cancer, SIR = 1.08, 95%CI: 0.91-1.26. To date (2001) over 50 studies have shown adverse biological or human health effects specifically from cell phone radiation. These research results to date clearly show that cell phones and cell phone radiation are a strong risk factor for all of the adverse health effects identified for EMR because they share the same biological mechanisms. The greatest risk is to cell phone users because of the high exposure to their heads and the great sensitivity of brain tissue and brain processes. DNA damage accelerates cell death in the brain, advancing neurodegenerative diseases and brain cancer. Brain tumour is already an identified risk factor. Cell phones are carried on people's belts and in breast pockets. Hence liver cancer, breast cancer and testicular cancer became probable risk factors. Ghana's growing mobile phone industry – any health implications? Do mobile phones really cause cancer of any kind? Is their use in any way connected with the occurrence of diseases such as leukemia and impotence? Ghana's mobile phone industry is growing fast. Records available from the National Communications Authority (NCA) show that mobile telephony in Ghana has exceeded 7,604,053 subscribers. And the number of mobile phone companies is growing. There are currently about six mobile phone operators licensed to do business in Ghana. Certainly, the growing number of providers will see an increase in subscription rates and accompanying increase in the number of sophisticated handsets that Ghanaians use. Subsequently, there will be an increase in the number of base stations or transmitter towers that mobile phone companies need to be able to make subscribers make and receive phone calls. But has the side effects of this growing and essential industry been taken into account and adequate policy made to handle them, should they occur? Some scientists say that the technology used by the communications industry emits a type of electromagnetic radiation (EMR) that poses a health hazard to people. But local mobile phone companies, on the other hand, say, "it is only speculation." In their view, there is no scientific fact to back the claim. These days, mobile phones have become the most convenient mode of communication these days. And this technological advancement has turned the world into a globalised village, and Ghanaians are happily part of it. But at what costs? For a mobile phone to send and receive calls, it must be within range of a transmitting tower. A mobile phone works just like a radio does: if you are too far from the station's signal, your radio (or phone) cannot pick up the music (or receive a call). Radio stations, in order to transmit to a larger area erect transmission towers. Mobile phone companies also use transmission towers to relay messages to users at great distances. The towers, and to a lesser extent, the hand sets, generate electromagnetic radiation (EMR). While most EMR is not considered to be dangerous to humans, scientific study shows that the EMR from mobile phone, radio and TV transmitter towers very likely is. Prof. Kofi Oduro-Afriyie, a Physicist and Vice President of Central University College, Accra admits that no specific research has been done with regards to mobile phones in Ghana, but was quick to confirm that EMR is a known health hazard. "Even though our human bodies need a certain level of radiation to survive, too much of it will cause genetic mutations, leukemia, cancer and impotence," he said. He explained that "electromagnetic radiation is all the more dangerous because these diseases take about 20 years before they show." Evidence of the danger comes from studies done in other countries. For example, the "EMFacts Information Service" a publication specialized on radiation issues in Australia, states that "although the exposure to the radiation from mobile phone towers is extremely low, the risk of cancer and other diseases is increased when the exposure is for long periods" such as for people living near these towers. EMFacts also reports that a research team led by Dr B. Hockings found that children living within four kilometres of TV transmission towers in Sydney showed higher rates of childhood leukemia, the disease most often implicated with exposure to EMR. In fact "childhood leukemia in the exposed (closer) group was 60 per cent higher than in the control (further) group." In this study, the level of EMR was 1000 times lower than the Australian standard. Of great concern to researchers is that children seem to be more affected by EMR than are adults. In other research, a 1990 study by Richard Hayes found that men who were exposed to micro and radio waves had a greater incidence of testicular cancer. A 1987 study by Dr W. Morton of the University of Oregon's Health Science Centre, found excess cancer among people living close to radio and TV broadcast towers. A Polish study found that soldiers exposed to EMR suffered from increased rates of leukemia and lymphoma. At the same time, Drs Henry Lai and Narendra Singh in Seattle, USA, found that exposing rats to 'safe' levels of radiation resulted in increased breaks in the DNA of their brain cells – and damage to DNA is associated with the initiation of cancer. Whatever the health risks and associated demands on Ghana's health budget, the mobile telephony companies are here to make profit, and they won't be the ones paying the hospital bills, so what do they have to lose? Ghana's trade liberalization policy, linked with a desire to strengthen the private sector, the zeal to open the country's doors for Foreign Direct Investments (FDI) has opened the door to a proliferation of private phone, radio and TV companies. These companies are employing aggressive and competitive marketing strategies, they have together won millions of Ghanaians. With the growing demand for more services, the number of transmission towers will multiply, and they are, on a daily basis. These expansions are being pursued without considering the possible health hazards associated with the EMR these towers pour into their surroundings. And these days, it is not uncommon to see cell sites and transmission towers sited in densely populated areas, and these apart from the dangers of radiation do pose physical dangers to residents. A recent incident in Tema where a transmission tower collapsed over a building during rainstorms is an example. In some instances, residents have gone to court to stop mobile phone companies from erecting transmission towers in their communities, citing possible side effects of radiation on their health as reasons. The mobile phone companies appear unconcerned. For them profit is everything. To them the issues that are being raised by scientists are speculations with no real proof. And of course evidence exists elsewhere showing that some very influential mobile telephony companies have commissioned scientific researches of their own that have shown proof to the contrary – that there are no dangers to health from using mobile phones. To achieve their lofty targets and maximize profits, the mobile phone providers are "extolling the benefits and denying the risks, in spite of mounting scientific evidence to the contrary. In the face of these challenges, what should be done in Ghana? What national safety standards should be set to regulate EMR emission levels? The Environmental Protection Agency (EPA), the agency responsible for regulating the environmental activities of businesses, has not identified the mobile phone companies as having a significant impact on the environment. According to an EPA insider, mobile phone companies are required to register with the EPA but not to submit Environmental Impact Assessments before they commence business. And there have been instances where some of the companies have gone ahead to erect transmission towers without permission from the EPA and have been asked to pull these down after residents have drawn the attention of the EPA. The Ghana Standards Board (GSB) has likewise not considered setting standards for mobile phones. A source stated that they respond to the immediate needs of the country and that when a need is identified, they are willing to work on it. If faced with the evidence, they will study it and set up a technical committee to come out with standards. The National Communications Authority (NCA), seems to simply give licenses for mobile companies to operate. They even lack the necessary clout to get these companies to meet the requirements for their operations such as providing quality services for their subscribers. Until recently, when the NCA showed that it has got teeth, it has always been seen as a toothless bulldog. It opened wide its mouth to bring some sanity into the industry by ordering two of the service providers to clean-up their acts. They also ordered the two companies to halt any further signing on of new subscribers until they improved their services. But it is yet to be seen, whether they can really bite, because, there is strong suspicion among Ghanaians that the companies are still increasing their subscriber base even after the directive. Ghana can take a cue from other countries of the world that already have permissible levels of radiation emission. Countries, like the USA, Britain, New Zealand and Australia, have set national standards to prevent high levels of electromagnetic radiation and the resulting illnesses in their citizens. The situation in Ghana, which has no EMR safety standards, is all the more disturbing because the mobile phone companies doing business here have not taken precautions to protect their customers. For example, salesmen of some of these companies are themselves unaware of the safety issues of mobile phone usage. When asked about what they tell customers, they simply said, 'we tell our customers not to use the phone often - because it is expensive." Another salesman said he advises his customers to get a leather jacket for their phones and to carry them somewhere other than a breast pocket to minimize the health dangers such as cancer. However, one marketing manager ruled these out as safety measures, insisting that they only advise customers to get leather jackets to prevent scratches on the phone. About 20 mobile phone users who were interviewed confirmed they have only been taught how to use the phones, nothing more. Nothing was mentioned to them by company employees about health dangers associated with mobile phone usage. The communications companies would like their customers to believe that there is no health controversy. Neither would they like the people who are living and working near their transmission towers to question the effects of the electromagnetic radiation these towers give off. However, in other parts of the world, the controversy rages on and for us in Ghana, the emerging facts about the issues can be looked at carefully in our context. Looking at our Ghanaian situation, where we have limited, if not zero resources to handle the ill effects of electromagnetic radiation, to be forewarned is to be forearmed. It is our duty to inform our people, so they can make informed choices. It was nine years ago when I first raised the flag, but no one seemed to have seen it. Dr Bockings, the Australian Researcher, recommended then, that, "it would be prudent for some countries to set up perspective epidemiological cancer studies of possible effects of mobile phones -both base stations (transmission towers) and hand held units - so that in 10 years we have some answers." This advice was given in 1998. Tens years on, nothing concrete has happened. This item about the Glastonbury Wi-Fi system was in the Sunday Telegraph today. Glastonbury alternative therapy practitioners blame the town's Wi-Fi system for a spate of health problems. It is regarded as an oasis of calm and tranquility, and the nation's capital for alternative health therapies and spiritual healing remedies. But now the residents of Glastonbury, which has long been a favoured destination for pilgrims, are at the centre of a bitter row in which many blame the town's new wireless computer network - known as wi-fi - for a spate of health problems. which are known as ley lines. There are now calls for the project, the first of its kind in Britain, to be "unplugged" and for wi-fi masts in the centre of the Somerset market town to be removed just seven months into its experimental run. Meanwhile soothsayers, astrologers and other opponents of the wi-fi system have resorted to an alternative technology - known as "orgone" - to combat the alleged negative effects of the high-tech system. At a public meeting to discuss alleged health problems in the Somerset town, residents complained of numerous symptoms including headaches, dizziness, rashes and even pneumonia. Protesters claim that radiation associated with the wi-fi network suppresses the production of melatonin, a hormone which helps to control sleep patterns, regulates the body's metabolic rate and boosts the immune system. One of those who claims to have been affected is Natalie Fee, a former yoga teacher, who has now moved home - from inside to outside the wi-fi zone - so that she can protect her son Elliot, five, from what she sees as the harmful effects of wi-fi. "I would like to see the masts removed," she said. "Perhaps one day that will happen and hopefully it won't be too late. "I had a radiation expert come round to take measurements at our old home which was within sight of one of the masts. The highest reading was in Elliot's room. "I thought Glastonbury was a rural town. I don't want my son exposed to risk 24 hours a day, including at his primary school which is within the wi-fi zone. I would be failing in my duty as a parent if I did." Orgone science was developed by the Austro-Hungarian psychoanalyst Wilhelm Reich, who claimed all living matter contains a biological energy. Mr Todd added: "The science hasn't really got into the mainstream because the Government won't make decisions which will affect big business, even if it concerns everyone's health. "I think wi-fi has tipped things over the edge because a lot of people can feel it. It seems to have introduced this large blast of energy into the environment and that's what people are picking up on." Jane Saunders, who runs the Glastonbury natural health clinic, felt so strongly she founded the Why Wi-Fi? protest campaign. "I am not a Luddite and I recognise there are benefits to new technology," she said. "Initially wi-fi was a development I welcomed with open arms, especially with teenage children who need to be on-line almost all the time. "But I had to take it out and go back to a conventional broadband cable network because it was affecting my health. I show symptoms when it's switched on that I don't when the network is off." A spokesman for Powerwatch, an independent EMF pressure group, said: "Someone using a wi-fi laptop will be exposed to approximately twice the level of radiation as someone living 70 yards from a mobile phone mast. Unlike the food and drink industry whose products have to go through extensive pre-market trials and testing, there is no safety net for wireless devices." However, Dr Eric de Silva, a physicist at Imperial College, London, disagreed. He said: "All the studies which have so far concluded show there is no evidence of a connection between exposure to wi-fi and ill health." A Somerset County Council spokesman said: "The project was established to support the local economy and encourage tourist and business visitors to stay longer and use local services. I have a comment on the above information provided by Dr. Eric de Silva, because it is so incorrect, and is such an irresponsible statement to make. illnesses. It would appear that Dr. da Silva is either lying to the press, miss quoted, or he is speaking on a subject that he is quite ignorant about. Either way, he needs to correct his serious error and provide accurate information to the public. The statement by Somerset County Council also gives great reason for concern. How can a system like this be an asset, if it is known to harm the citizens exposed to it? The councillors responsible for this experiment need to educate themselves about the dangers of microwave radiation (see - http://www.bioinitiative.org/ ). It is a shame that they did not do this, prior to approving this dangerous technology. This important information points to another reason why electro magnetic radiation is causing harm to humans and other living things. It has been widely known that our brain and nerves are controlled by small electrical pulses, but now there is a new discovery, that proves our cells contain strong electric fields. It is not surprising that when we are exposed to artificial electrical fields and electro magnetic radiation, that it will affect the normal operation of our body and our health. Thanks Mary-Sue, for sending this information. A wireless, nano-scale voltmeter developed at the University of Michigan is overturning conventional wisdom about the physical environment inside cells. It may someday help researchers tackle such tricky medical issues as why cancer cells grow out of control and how damaged nerves might be mended. U-M professor Raoul Kopelman will discuss the device Saturday during a special session, "Creating Next Generation Nano Tools for Cell Biology," at the annual meeting of the American Society for Cell Biology in Washington, D.C.
"The basic idea behind this field of research is to follow cellular processes—both normal and abnormal—by monitoring physical properties inside the cell. There's a long history of research on the chemistry happening inside the cell, but now we're getting interested in measuring the physical properties, because physical and chemical processes are related," said Kopelman, who is the Richard Smalley Distinguished University Professor of Chemistry, Physics and Applied Physics. With a diameter of about 30 nanometers, the spherical device is 1,000-fold smaller than existing voltmeters, Kopelman said. It is a photonic instrument, meaning that it uses light to do its work, rather than the electrons that electronic devices employ. Kopelman's former postdoctoral fellow Katherine Tyner, now at the U.S. Food and Drug Administration , used the nano-voltmeter to measure electric fields deep inside a cell—a feat that until now was impossible. Scientists have measured electric fields in the membranes that surround cells, but not in the interior, Kopelman said. With the new approach, the researchers don't simply insert a single voltmeter; they're able to deploy thousands of voltmeters at once, spread throughout the cell. Each unit is a single nano-particle that contains voltage-sensitive dyes. When stimulated with blue light, the dyes emit red and green light, and the ratio of red to green corresponds to the strength of the electric field in the area of interest. Tyner's measurements revealed surprisingly high electric fields in cytosol—the jellylike material that makes up most of a cell's interior. "The standard paradigm has been that there are zero electric fields in cytosol," Kopelman said, "but all of the 13 regions we measured had high electric field strength—as high as 15 million volts per meter." In comparison, the electrical field strength inside a typical home is five to 10 volts per meter; directly under a power transmission line, it's 10,000 volts per meter. Kopelman, Tyner and coauthor Martin Philbert, professor of environmental health sciences and associate dean for research at the U-M School of Public Health, published a report on the nano-voltmeter and their paradigm-shattering findings in Biophysical Journal in August. Those findings leave the researchers wondering why electrical fields exist inside cells. "I don't know the answer to that," Kopelman said. "I suspect that finding out exactly what's going on will keep a lot of people working for a long time." But the ability to measure internal cellular electrical fields should aid in that endeavor. It's already known that changes in electrical fields associated with membranes can play a role in diseases such as Alzheimer's, and researchers have been exploring the use of externally-applied electric fields to stimulate wound healing and nerve growth and regeneration. As for the U-M researchers, Philbert, a neurotoxicologist, is exploring how intracellular fields change with exposure to nerve toxins, and Kopelman, who is collaborating with Philbert and researchers in the U-M medical school on new approaches to cancer detection and treatment, is interested in comparing electric fields in cancerous and non-cancerous cells. But they're also open to other avenues of research, Kopelman said. "One reason for going to the ASCB meeting is to confer with colleagues and strategize about where to go next." In retirement Cyril Smith continues to give lectures and to write articles about this complex electrical-chemical interactivity and its effects on biological functionality. The problems of the effects of the electical environment on sensitive persons are to be sought through disturbances of their autonomic nervous system rather than in terms of mental disturbances. There is usually an underlying body load of toxic chemicals leading to these chemical sensitivities presaging the electrical sensitivities and unless this body load of toxic chemicals is eliminated, their electrical. ITS launch six months ago was marked by a small but clear protest declaring that WiFi was not welcome in Glastonbury. The scheme gives residents and businesses wireless Internet access, and the growing friction reached a peak on Friday at a public meeting when some people continued to claim their health had been affected. Most of those at the meeting, hosted by Somerset County Council, called for the system to be unplugged. For two hours, residents expressed anger at not being told about the system before it was implemented. Since it was switched on in May, many residents claim to have been suffering from symptoms such as headaches, dizziness and, in some cases, panic attacks. Some say they are no longer able to visit the town because the effects are so severe. Jane Sanders, a Glastonbury resident of 20 years, was first to raise the health concerns and said: "I was really devastated when I found that the new Glastonbury WiFi signal reached my office. It had not occurred to me that it would stretch that far, so I wasn't expecting it. But I noticed when sitting in my office that I began to feel some familiar symptoms. "These were similar to how I've felt when in a WiFi zone before: brain-fog, slight dizziness and a sense of not being able to think straight. I checked that I was receiving a signal and found, to my dismay, that I was in the Glastonbury WiFi zone." Natalie Fee of Glastonbury said: "My family and I moved house last weekend. We really didn't want to, but I was not prepared to have my young son sleeping next to a WiFi mast for the next ten years. "I am pro-broadband and pro-progress and I welcome the benefits something like this can bring a town, but I would have liked to have seen it set up another way. A cable connection, for example, would have provided no health risks at all." Another resident, Angela Davis, said: "We had no say in this, our choice seems to have been taken away. I, for one, do not want WiFi radiation beamed into my living room." The system is the first of its kind in Somerset to be run by a local authority and operates through six antennae in the town centre. Laptop users can log on to the town portal page and from there can buy credits to surf the Internet further. The county council has always insisted WiFi antennae do not affect health, and a spokesman said: "We will always take safety concerns seriously, but are completely confident that the WiFi project poses no health risk to anyone in Glastonbury." Other residents said they simply did not see the point of WiFi. Richard Chiswell, who has worked in IT for 12 years, said: "Nowadays, people wanting to access the Net will do so through handheld devices. It has been three years from the inception of the Glastonbury WiFi to its realisation, the technology is already behind. "At least three cafes in Glastonbury can provide WiFi anyway. Anyone wanting to use it would be better off spending the money on food in these cafes and surfing at their leisure, rather than paying for credits to access the Internet elsewhere." Resident Roy Proctor said: "I think the people behind the WiFi initiative are ignorant of the concerns of local people; whenever the health issue is raised by someone, they are often met with ridicule." People were also unimpressed with statistics put forward by the county council which showed there have been 422 users of the WiFi service during the past six months. Protesters said there were a similar number of signatures on a petition to have the system removed. Dave Cornish, Somerset broadband programme manager for the county council, said: "The Glastonbury WiFi project is a pilot scheme and nothing regarding its future is set in stone." The council has pledged to include the opinions of the local community, the petition and research on the health effects of WiFi in its latest report, which will form the basis of a final decision on the future of the scheme. It's like something you'd see on Star Trek. Placing an electromagnetic device on your head to get rid of migraine headaches. Doctors at Mayo Clinic are studying such a device and their research shows it works for some patients. This year neurologist D. David Dodick helped design a study to see if a device, when held against the back of your head, can stop migraine headaches. "It' called a trans-cranial magnetic stimulator, " said Dr. Dodick. You see, during a migraine attack certain networks in your brain becomes hypersensitive and activated. The device generates an electro magnetic field that penetrates your scalp and skull and short circuits that abnormal electrical activity. Dr. Dodick and colleagues divided 267 people into two groups. One used the real device when they got a migraine and the other group used a sham device. "The group who stimulated with the real device did significantly better than the group with the sham device. They feel improvement anywhere from 30 minutes to two hours later." And unlike many migraine medications, the device seems to have no side effects says study safety monitor Dr. Bart Demaerschalk. "It appears to be exceedingly safe and a nonpharmacological opportunity for treatment of migraine." "It definitely improves pain and it definitely improves other symptoms like the nausea and sensitivity to light and noise," said Dr. Dodick. Trans-cranial magnetic stimulation is still in the investigational phase and is not approved by the food and drug administration. But Dr. Dodick and Dr. Demaerschalk hope the device will be available to the public within a year or so. 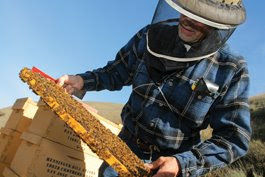 A fringe theory is that cell phones somehow affected the navigation of the worker bees, so they aren't able to find their way back to the hives. Henninger doesn't believe that one at all. "I would have been dead in the water years ago," he says. He has a cell phone antenna on his property. Triangle Mountain resident Sharon Noble, in a photo taken in April, was instrumental in bringing about Colwood's new policy on transmission towers. Colwood is now fully armed in its continuing battle against transmission towers. In an attempt to manage electromagnetic radiation from towers, the municipality has adopted an antenna consultation process that covers not only new tower applications but all transmitters "whether new or replacement" regardless of whether they're on an existing or a new structure. After years of fruitless complaints about transmission towers on Triangle Mountain, Colwood's stated policy is it does not support the installation of antennas and/or transmission equipment in areas where people live. Further, the city intends to work toward having existing towers on Triangle Mountain removed. Industry Canada is the sole authority over transmission towers, but it has a policy of consulting with local jurisdictions before making decisions about the towers, said Chris Pease, Colwood administrator. "It's something we would require proponents to go through. It's really consultation with the community," Pease said. "This grassroots push is to try to say that there's some evidence that there could be harmful effects from outputs onto human beings. And what do we need to do to try to mitigate ... electromagnetic radiation?" Colwood believes the federal government hasn't paid enough attention to the mounting evidence of the effect transmission towers might have on human beings. "But in fairness, if you look at research literature, there's information on both sides," Pease said. The new policy pleases Triangle Mountain resident Sharon Noble, who was instrumental in bringing it about. Its intent is to capture not only new tower applications but also upgrades, she said. "I was very concerned that our current consultation policy didn't have that in there -- that they could put in new transmitters and would not be subject to consultation. And they could be put right in the middle of neighbourhoods and people wouldn't need to know. "They could be put on churches or power poles or something like that. So the intent [of this] is to cover every contingency." Colwood and the federal government have been at loggerheads over the towers for years. Residents in the Triangle Mountain area have long complained of interference with electrical equipment, including cars that won't start, garage doors that have a habit of opening themselves and VCRs that have a mind of their own. More recently, some residents have complained about recurring health problems such as chronic fatigue, nausea and itchy skin that they say could be the result of overexposure to electromagnetic radiation. If you would like to have a copy of the policy please let me know. Wishing you a wonderful Christmas and a healthy, antenna-free 2009! "No more GSM phone masts"